The second part of the blog series which looked at the SDG’s No. 1 No Poverty and No. 2 Zero Hunger, will now be considered more closely with the next two parts of the SDG’s, these being: No. 3 Good health and well being and No. 4 Quality Education. I was born in Germany and I live here still as well. More precisely, I live in Berlin which is the capital. I often think about faraway places and long to live in foreign countries. From a young age, my grandfather taught me to consider all factors, evaluate and weigh out the pros and cons. I often reflect on my own desire to emigrate, and one very important detail does come to mind. There is hardly any country which offers such a good health system such as here in Germany (even though one also complains about it) and this aspect especially makes me hesitant to move elsewhere. When I am sick or someone from my family is, I don´t need more than 5 minutes to go to the next pharmacy in order to get medication. Within a radius of approx. 2 km, there are at least 50 doctors with different specialisms. In addition to this, there are also physiotherapists, occupational therapists, speech therapists, etc. In Berlin, there are over 17 hospitals with different medical focuses. If I am not well, I have not only the opportunity to be treated immediately, but I have even the choice between the individual doctors and hospitals. What a luxury of which we are not even aware of! Each of us has at one point had terrible pain, toothache, stomach or headache. Image, you had to walk 50 – 100km by foot to get help. Or you are giving birth without any professional help, no one that is by your side, helping and guiding you. I cannot even imagine this and with every year of life I am grateful for this privilege. Not to forget that in Germany you are usually covered by a health insurance and most treatment costs are easily taken over by this. I can just easily use my health card for this. In addition, it is a privilege at any time to call an ambulance or emergency doctor to come at night. As an example, when I was an exchange student in the US, I lived with a family whose Mexican relative, who also lived in Los Angeles, did not want to go to the doctor with a fractured arm because she was neither insured nor did she have sufficient money. I was totally perplexed, I was in the USA, a world leading country and thought, how is this possible? For me it was an awakening, that not every country with a strong economy offers its residents a reasonable health system. Imagine that in a place with a population 20,000, there is only one doctor available. 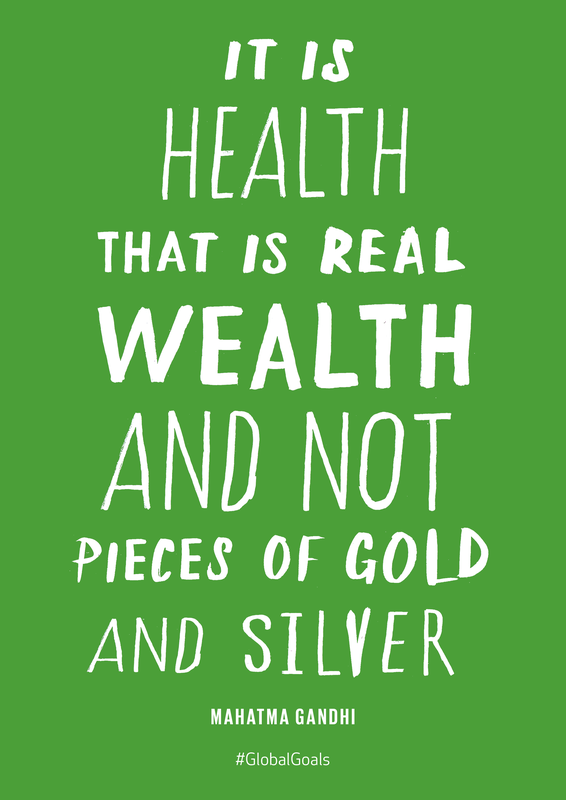 Health and wellbeing as described in SDG No. 3 correlate to the average life expectancy of a country. The two countries in Africa, Sierra Leone and Angola have one of the least life expectations of only 50.1 and 52.4 years. 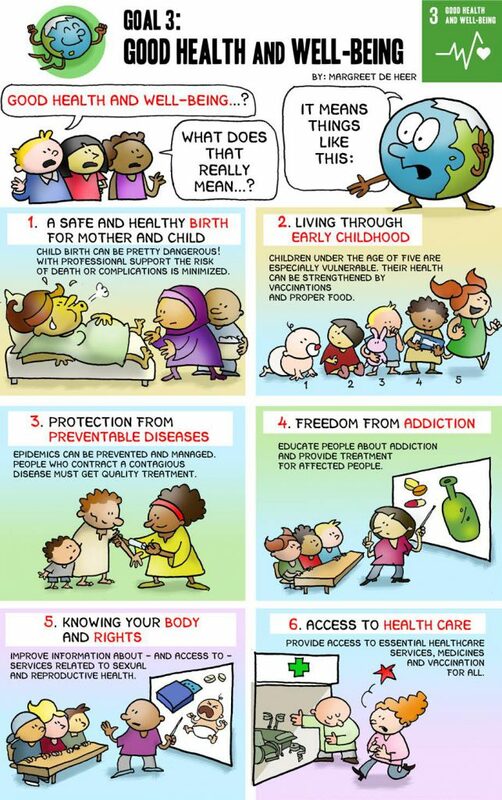 How can I explain to parents that they know the necessary care for the health and hygiene of their children? Through education. – Knowledge is a necessary asset and in this case, it can even save a human´s life As I mentioned in the first blog, all the global goals need to be seen as a whole and not individually. This is especially in regard to Goal No. 4 Quality Education. Where equally accessible, education makes a proven difference to social and economic inequality. Education can give people skills to participate in shaping and in maintaining more sustainable sities, and to achieve resillience in disaster situations. Education can make a critical difference to productive patterns (e.g. with regard to the circular economy) and to consumer understanding of more sustainably produced goods and prevention of waste. Education is key to mass understanding of the impact of climate change and to adaption and mitigation, particularly at the local level. Education is important in developing awarness of the marine environment and building proactive consensusregarding wise and sustainable use. Education and training increase skills and capacity tp underpin sustainable livelihoods and to converse natural resources and biodiversity, particularly in threatened enviroments. Social learning is vital to facilitate and ensure participative, inclusive and just societes, as well as social coherence. Lifelong learning builds capacity to understand and promote sustainable development policies and practices. In February 2016, Uruguay was the first school in South America to open a public school with emphasis on sustainable development. The school ´Public School 294´ was set up as part of the project ‘a sustainable school’ by the social organization called Tagma. The building, called ‘Earthship’, is a self-contained with over 60% recycled materials collected by the municipality. In this process, the neighbors, teachers and children were also involved in the development. Natural resources like solar energy and filtered rainwater supply the school with electricity and water. For me, this school is unique and very inspiring, that I’ve made successful contact with Victoria Gómez to learn more about including sustainability into the curriculum. Unfortunately, I am still waiting for the answers to my questions and will submit them as soon as possible, so that the completion of this blog post will not be delayed any longer. I am very happy that I have received an answer to my questions to Victoria Goméz of Tagma and can take a summary at this point. She pointed out, however, that after the completion of the project the school was handed over to state hands and Tagma has no further influence on the teaching or learning content, as this is incumbent upon the state.She gave me the contact details of the director of the school in order to obtain more detailed information, but the contact has not yet been achieved. How many students are enrolled at the school and how are they chosen? The regular procedure of an Uruguayan public school is followed: you have the right to enroll if you live close by, there is no selection process. Today, there are 60 kids enrolled, from 5 to 12 years old. Next to the normal curriculum, how is stustainability integretated within the lessons? Are all Sustainable Developments Goals of the UN ingtegrated in the curriculum? If yes, how? Yes they are. I´m afraid you´ll have to contact the Director of the school, […], because she is the one allowed to answer about. May you describe a typical school day at the sustainable school? I can tell you that kids’ journey starts at 8.30 and at 12 they have lunch at school, have a break, and have more classes from 1 to 2 pm from monday to friday. It is a rural model so they work in three groups: one of kids in initial grades (4-5) in charge of a teacher, another of 1st, 2nd and 3d grade in charge of another teacher, and the third one in charge of the director, with 4th, 5th and 6th grade kids. Is the theme sustainability integrated within the normal lessons time (like the time for gardening), or do the students have to stay longer in school than in other public schools? It is part of the normal lessons, although there are special events like the Earth Day or community days when kids stay longer, go on weekends, involving also the families and other local people. Do you have special school project that teach a sustainable lifestyle? Tagma developed a non-formal educational project in order to inspire and facilitate learnings on how to live in an earthship, how to operate it and conservate it: imagining, building and inhabiting a school ship, through workshops with children, teachers and families of the educational community of School No. 294 of Jaureguiberry. Extra training on building an earthship was provided through scholarships in the Earthship Academy conducted during the building, and other special workshops, for parents and collaborators from the community. At the same time, being a school, we led a complementary participative module where the teachers could understand the systems in the building and their interaction with natural forces, along with the specific approach of ecological education within the ESD framework*, in order to identify what areas of learning might be more and better taught by living in an earthship. As a result, they developed a school project around gardening where they could teach, in an integrated way, agronomy, computing, maths, language, social sciences, etc. *We got the ESD prize by OMEP last year. How do students, parents, teachers are thinking about the school concept? Do you hear critical voices? From the beginning, there was a group of active enthusiastic parents giving support to the project in spite of their few resources for organization. The 2 directors that worked at the school in the period were also enthusiastic. Last year, the whole team was very active in learning and taking care of the earthship: 1 Director, 2 teachers, 1 chef, 1 cleaning and managing assistant. We did hear critical voices, especially before the school was built and just few before they could see it actually working. This year, many families moved to Jaureguiberry in order to send their kids to the school, showing real enthusiasm about it. What is the best thing about that school concept? The most striking thing, and our very first goal, was to show that a school like that is possible: is technically, economically, cultural and socially possible even in the “third world”, even in the public system, even in a community that didn´t asked for it, even led by young citizens with no expertise in something as ambitious as that. We can built and live in a more sustainable way, what are we waiting for? Making it a school, and a public school, reinforces the message that this is the most important thing that we need to learn, and give an active role to the citizens of the future, not through anxiety or fear but through the direct experience of beneficial sinergies with nature. It also states that is an option for everybody, not for an elite of eco consciouss families but something that should be at the heart of the policies and the communities. How was the schoolbuilding/conecpt funded? […] we (the non profit Tagma) designed and led the project in a volunteer basis, articulating with different stakeholders like ANEP (Public Administration of Education) and Earthship Biotecture (Reynolds’ company), among others. The first sustainable school belongs to the public network (in Uruguay, it means funded and managed by them in all aspects, within a very centralized educational system). The building concept was provided by Earthship Biotecture, it was developed by the US architect Michael Reynolds. It is one of his housing models but adapted to the Uruguay official requirements for a school buildng. Reynolds had built sustainable amazing houses everywhere but never a primary public school, and he had not developed an educational programme besides learning how to build it. A lesson plan “Children on the Move” is found unter the heading World Largest Lesson. If you are also interested in teaching and sharing the Global Goals, then you can find material, videos and events under the following: #TeachSDGs . The next goals will be presented soon.